Are you thinking about getting a new office chair? Are you wondering how to choose the best chair for your needs? Nicole Ferrari, director of Staples brand furniture shares her insights in this exclusive expert interview. LoveToKnow (LTK): How can a person tell when it's time to get a new office chair? Nicole Ferrari (NF): A person can tell when it¹s time to get a new office chair when it no longer offers good support and comfortability. Signs that it's time to replace your chair include back strain and hunching throughout the day. If the padding of the chair is worn down so the surface is hard, sitting will be painful after a couple of hours and not pleasant to sit on for long periods of time. LTK: How can a person tell if a particular chair provides appropriate back support? NF: Your chair's backrest should provide support from your lower back up to your shoulder blades. Many chairs also provide lumbar support -- this arches the lower part of the chair out to support the natural curve of your spine. Height-adjustable backrests are another available option on some chairs, letting you customize the fit to the contours of your individual body. 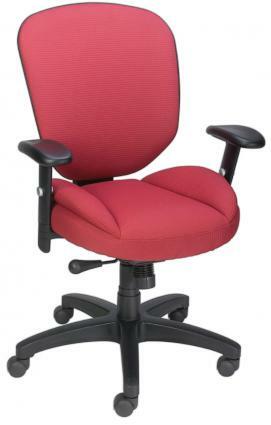 LTK: What are the most important features to look for when selecting a new office chair? NF: Look for chairs that can conform to your body and adapt to changing tasks. In addition, look for chairs with multiple features and points of adjustability including seat height, back height, 360 degree swivel, back tilt, arm height, tilt tension and casters. Make sure the seat is large enough to accommodate frequent changes in position and support an even distribution of your weight. You should also consider a seat with a "waterfall edge" that slopes in the front. This type of seat promotes better leg circulation by comfortably supporting your thighs and leaving no pressure behind the knees. Additionally, look for chairs with armrests that support your arms, while allowing your neck and shoulders to feel relaxed. Adjustable armrests are another great feature as they can be raised and lowered to the optimal position for your individual body. In addition, many people opt for padded armrests for extra comfort. LTK: Is ergonomics an important factor to consider when selecting an office chair? NF: Yes! Stress on the back is increased 40 to 90 percent when sitting. Selecting an ergonomic chair is therefore a key factor to consider when purchasing an office chair. Ergonomically correct chairs play an important role in one's posture and put less stress on the body, allowing individuals to be productive for longer periods of time. LTK: Are there any features to avoid when shopping for a new office chair? NF: Almost all features that are available in office chairs serve a purpose. The key is to focus on the features that best fit your needs. Most important is making sure that the chair you select can adjust to the natural contours of your body, providing maximum comfort and support while sitting. LTK: How can an individual tell if a particular office chair is a good "fit"? NF: An individual can tell if a particular office chair is a good "fit" if the chair naturally conforms to his or her body. An individual's backrest should be positioned in a way that suits his or her tasks and allows the seatback to lock into this position. The contoured backrest of the chair should also match the natural contour of an individual's spine. LTK: What are the signs that a particular chair is not a good choice? NF: Signs that a particular chair is not the right choice for you include: finding yourself hunching your back, craning your neck, or straining your wrists while typing or moving your mouse. A chair is not a good choice when it does not naturally conform to your body, often resulting in discomfort or pain. LTK: What tips can you share for setting up your office chair for maximum comfort and safety? NF: When you get settled in your chair, the best seated position is not an erect 90 degrees, but rather a reclined posture of 100 to 110 degrees. Keep your feet flat on the floor or resting on a footrest if needed, and avoid craning your neck or hunching your shoulders. Try to keep your lower arms at right angles or slightly more open, resting on your chair's armrests, so that your wrists are straight when using the keyboard. Armrests provide relief to your shoulders, but they should not be used for typing. You can also adjust your chair to promote correct posture. For instance, adjust your chair's arms to make your own lower arms level with the desktop. This way you can use the keyboard and mouse comfortably and without straining. Make sure that you don't have too much lumbar support in your lower back -- too much lumbar will reduce the support to your upper back. Seat depth should be adjusted so you can place a clenched fist between the edge of the chair's seat pad and the back of your knee. Make sure your thighs fit comfortably under your desk or keyboard tray, and adjust tilt tension on your chair to suit your weight. LoveToKnow Furniture would like to thank Nicole Ferrari for taking the time to share her insights on when and how to select a new office furniture with readers.